Popular music recently lost one of its most iconic, creative and intelligent talents, David Bowie. 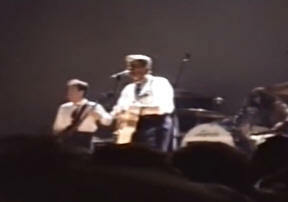 Bowie came to Newport in 1989 as part of his Tin Machine Tour playing a harder edged, more rock-based style of music in smaller venues. 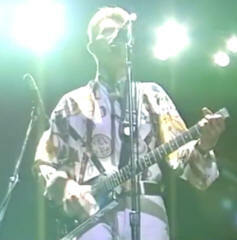 David Owens wrote in the Western Mail that Tin Machine was "a frenzied squall of punishing feedback, breakneck riffs and screaming guitar solos, the band polarised opinion, but when this newly-formed unit turned up to play the 1500 capacity Newport Centre, the opportunity to witness Bowie in such an intimate setting was too good an opportunity to waste, causing fans to camp out overnight in readiness for the following morning’s ticket rush." A Wales Art Review correspondent wrote of the gig " I witnessed the power of his charisma in 1989, from the stalls of the Newport Centre, when he was trying to blend in amongst the boys in the band of Tin Machine. But, it was clear from even where I was sitting and to my eleven year-old eyes that on stage was a unique force, an outstanding performer, a one of a kind singer; a mega star, and no amount of clattering, session-men rock could hide this."